Are you tired of scolding your hands as the heat burns its way through the cardboard slip? Are you tired of your fingers becoming numb as you attempt to hold an iced beverage? 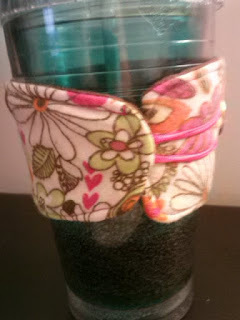 How about, are you tired of your cardboard/fabric/knitted/crocheted cozy slipping from your cup? When you purchase a cup cozy from Masquerade you will no longer have to worry about this! I work one on one with you until we have discovered the perfect combination. There are so many options as you can choose to add a crocheted flower, an iron on applique, lace or ribbon, I can also paint, stamp, and embroider all for a small fee! My cozies fit all sizes and can be adjusted from a small child’s cup to a 24oz cup! 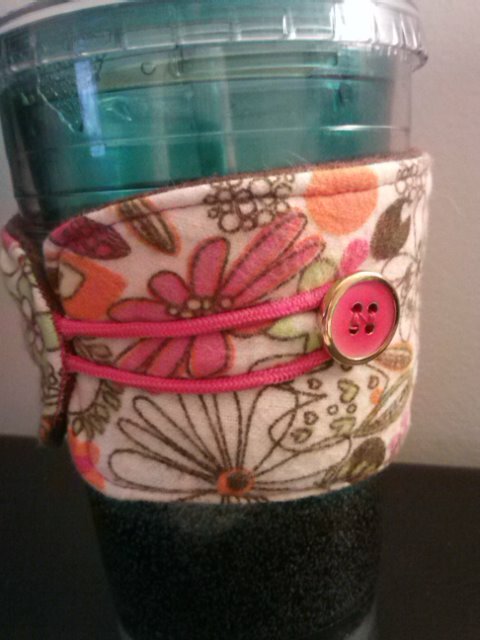 These cozies are not just for to-go cups either; they fit your mugs at home, plastic bottles, aluminum cans, and pint glasses, making these cozies the most bang for your buck. The fabric will never stretch out and lose shape, you will not have to worry about it slipping off because I place a gripper on the back of the fabric. 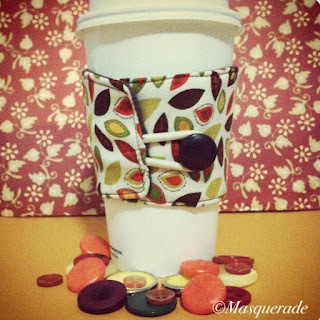 I received a complimentary Masquerade Cozy in exchange for my honest review. At first, when I heard of these cozies I was a bit hesitant to try it. Having Fibromyalgia, I'm very sensitive to the cold. I love the fact that it fits coffee cups as well as insulated cups like the one shown above. 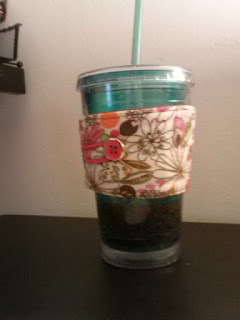 When it's frozen and melting, the cup sweats the cold water pretty bad, so this was the ultimate test. Not only did it absorb the sweat, it also still kept my hand dry. I loved it! Enter below on the rafflecopter to win one of 5 prizes!! Grand prize is 1st prize would be a (1)$50.00 Gift certificates to Masquerade (2) $25.00 Gift certificates to Masquerade, and (2) $10.00 Gift certificates. They are good for anything Masquerade makes (aprons, scarves, hair bows, bands and a whole bunch of this and that) with an expiration of 6 months after November 29. Want to order for Christmas head on over to Masquerade's Facebook (here) page to place an order before November 29 and use code PITCHLIST#1 to save 40% off!! !